The Beauty Scoop! 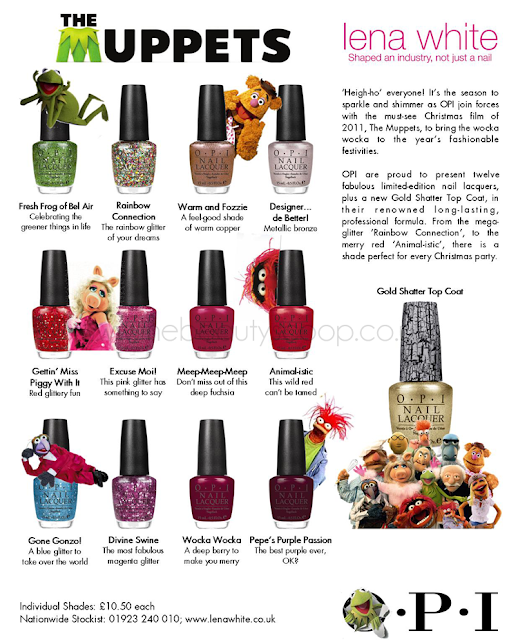 : OPI Holiday 2011 - The Muppets Collection! Last year's Christmas saw the incredible Burlesque range from OPI - a collection that I ended up buying every polish from (along with the Switzerland collection from slightly earlier too but shhh we won't mention that)! This year, we have... The Muppets, a collection that again looks like it’s going to cost me lots of money (again). I know sparkle and glitter are not to everybody’s taste, but to me they are my weakness, like shiny things to a magpie – especially at Christmas, which would be my absolute favourite time of year if it wasn’t for the dark nights and crap weather that comes with it! What do you think of the collection? Do you love or hate the look of it? I’ll be back with some swatches as soon as I can! Oh, these are incredible! I don't even like green nail polish, but I HAVE to get Fresh Frog of Bel Air because my car is called Kermit because it is the exact same colour as the frog - I can match my nails to the paintwork on my car! These are brilliant, I think I'll have to have them all!